Private lending with an IRA allows you to loan money to borrowers. You set the repayment terms, allowing your IRA to act just like a bank, but you get all of the tax benefits associated with an IRA. Private lending has become a popular investment tool for self-directed IRA owners. Your IRA plays the part a bank normally would and extends loans for mortgages and trust deeds, secured and unsecured notes, as well as judgments and structured settlements. Sophisticated investors are doing just that – making private loans to individuals or entities in an effort to substantially increase the wealth of their retirement accounts through earnings on the interest rates and other repayment terms of these loans. The private lender (IRA) provides capital to the borrower much faster and with more accommodating terms than traditional lending institutions. The IRA owner chooses the loan recipient, the type and terms of the loan, and also decides whether to provide secured or unsecured loans. Secured loans are backed by collateral to protect from default. Unsecured loans typically are offered at a higher rate of interest in lieu of collateral. Keep in mind that your IRA may not loan money to disqualified persons: you or your spouse, your parents or grandparents, your children or their spouses, your grandchildren or their spouses, and certain business partners and fiduciaries. 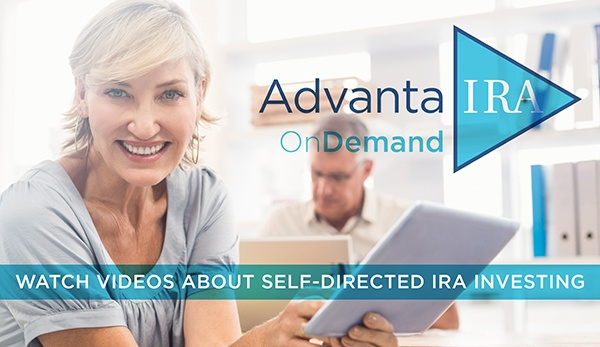 Advanta IRA makes it quick and easy for you to roll over an existing IRA, SEP, 401(k) or Keogh into a self-directed plan so you can begin exploring alternative investments. The self-directed IRA owner maintains complete control over investment decisions by investing in what he or she knows and understands. Advanta IRA enables investors to perform outside of the traditional, Wall Street box to make investments based on their own knowledge and expertise. Our offices are local, and we are leaders in our industry when helping you take control of your retirement plan. Advanta IRA makes self-directing simple for you.